Ever wish you could get a recipe for your favorite restaurant dish? Us, too. 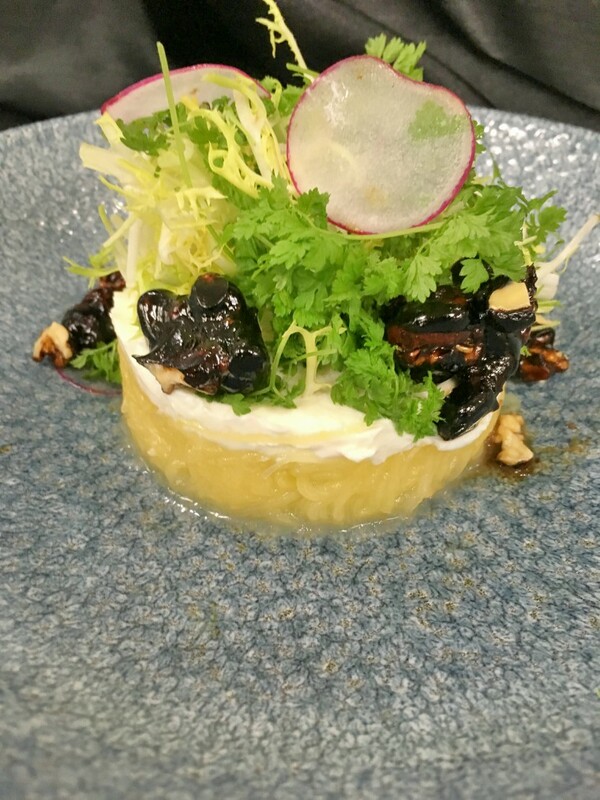 That’s why we caught up with executive chef Chris Calhoun for the details on this delicious starter from our menu. 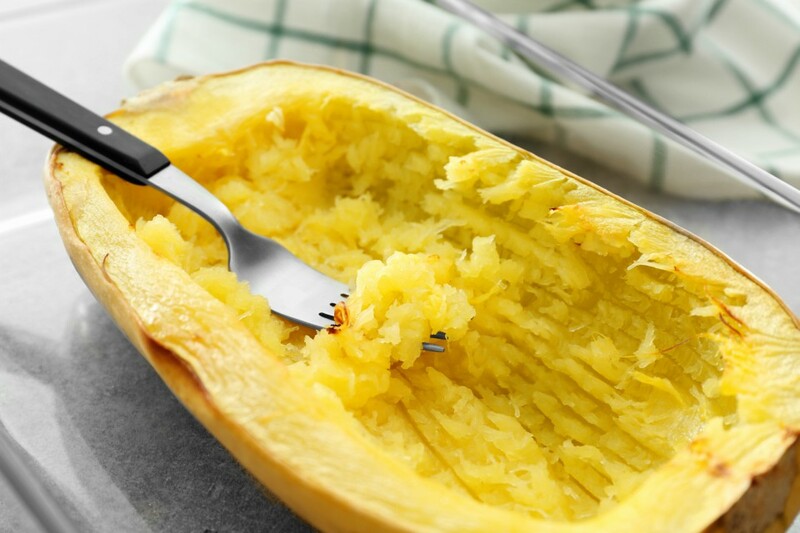 Spaghetti squash is abundant in late summer and early fall. In this recipe, he’s amplified its natural sweetness by roasting it with honey. Then he’s dressed it up with citrus juice to counter the sweetness and to match the acidity of the goat cheese and balsamic walnuts. The ingredients are simple, the flavors are complex and the presentation is impressive. Try this for your next dinner party, or stop in to dine with us and chef Chris can make it for you. Split squash in half and remove seeds. Drizzle interior with honey and olive oil. Place rosemary sprig in each half and season with salt and pepper. Place in shallow baking pan, shell side down, with the interior facing up. Add an inch of water to the pan and cover with foil. Bake at 375°F for 60 minutes. The strands of squash should just start to pull away from the shell when scraped with a small fork. If so, keep covered with foil and set aside to rest for 60 minutes as it cools. If the squash is still extremely firm, cover with foil and cook an additional 30 minutes. Soften goat cheese to room temperature. Add sugar and vinegar into a small saucepot. Boil down to a warm syrup. Cook together, stirring constantly. Continue until walnuts are well coated and most of the syrup is reduced and clinging. Scrape nuts out onto waxed or oiled paper to cool. Crush the nuts gently when cool. Scrape the flesh from the cooled squash into a mixing bowl. Season to taste with grapeseed oil, lemon juice, salt and pepper. In a ring mold, use the squash mixture as the base. Cover with a layer of goat cheese, smoothing it with a wet spoon. Remove ring and repeat process for each guest served. Garnish plates with sprouts, walnuts and additional olive oil as desired. For 25 years, The Desmond Hotel has earned a reputation for superior hospitality and comfort. We boast 194 well-appointed nonsmoking guest rooms and suites with modern amenities and hotel-wide free Wi-Fi. Our luxurious property offers three onsite dining options, two bars, indoor and outdoor fitness and beautiful grounds. We have the perfect setting for you—no matter the occasion. The Desmond is ideal for corporate meetings and retreats, wedding receptions and any kind of celebration. Events of all sizes welcome! This entry was posted in restaurants and tagged chef chris, recipes, vegetables. Bookmark the permalink.